Recently social media and I aren't getting along. This week has been especially bad, I think I need to just stay off-line. It seems that all anyone wants to do is argue. Someone will post that they like dogs and 5 different people will argue that cats are better. Everything seems to be a contest or argument. With the weather being cold I have been making soup left and right the this week. Unfortunately the light has been horrible to take photos and I just haven't been motivated. Thus, many of the great soup recipes that I have tried won't be on my blog (sorry!). I did make a great chicken recipe this week and that is what I'm sharing today. 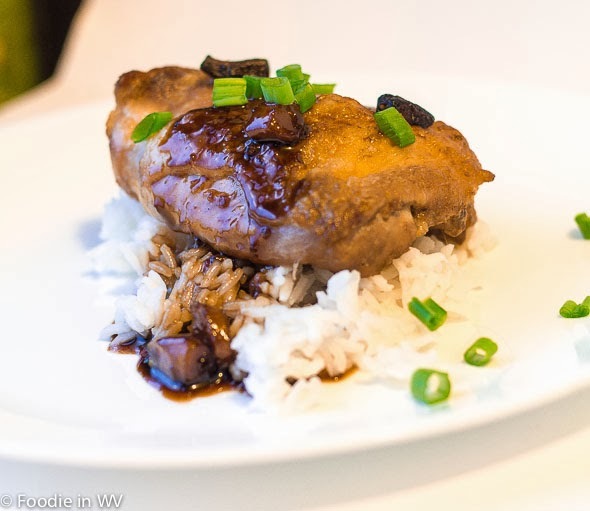 I tried a new recipe for Caramel Chicken from the October 2013 issue of Bon Appetit magazine. This recipe has 10 ingredients. It takes 1 hour 45 minutes of total time, 1 hour and 15 minutes of which is active. I did make a few changes to the original recipe. First, I only used chicken thighs instead of a mix of thighs and legs. My kids are on a chicken thigh kick and it's the only chicken piece they currently will eat. Finally, I used homemade chicken broth. I use homemade broth almost exclusively, the taste is much better and I can control the amount of sodium in my recipes. My family absolutely loved this recipe. The caramel sauce turned out fantastic. I let my sauce cook down until it was nice and thick and then poured it over the chicken. The result was as good as the best Asian restaurant in our state (according to my husband who has loved the same restaurant in Beckley forever). This is a recipe I plan on making over and over again in the future. (Sorry that the photos is so horrible, the light has not been on my side in the last couple of weeks, hopefully it will be better the rest of the week!). For the recipe go to Caramel Chicken. caramel on chicken? sounds delish!! i agree with you on social media...it truly has become a numbers game for many. It has definitely become a numbers game which has taken a lot of the social aspect out of it! Hahaha, it's always been like that, but maybe it's a full moon or something and that's making people even more argumentative. I have been staying off social media a lot lately. I just couldn't be bothered with the drama. I have to say that Oh my goodness Ann, this looks super delicious. I got a slow cooker/pressure cooker for Christmas from my brother and his wife and this year I plan on being in the kitchen more. I'm going to be going through all your recipes because I know you had quite a bit that I want to make. Hope you're having a great week! I feel the same way, way too much drama for my tastes :) I love my slow cooker!!! What a great Christmas present, I hope you find some great recipes to try in your new kitchen tool! You can even make oatmeal and desserts in one, so many options! Social media is getting way too dramatic for me. It is just too much arguing, way too many opinions floating around. I think that alot of people hide behind their social media profiles and just say what they don't in real life. Whatever! I just don't bother, if I see negativity, I skip it. BTW...I would've never thought of caramel on chicken but this looks delish! I think this sounds delicious, so I will check it out. I've given up on Facebook. I can't deal with the drama, the bragging, the phoniness, the arguing and competing...I just don't care! I haven't logged in since mid-October and I'm so much happier. I might delete, or deactivate, my account soon. Life is so much better without it! I feel like I got my old life back. Facebook is the worse, I agree. Not logging in is probably a good idea. It would definitely be better than all the negativity! WOW! That's too bad that you all have had to deal with so much social media drama. I just ignore idiots and move along but I agree, people are definitely hungry for attention and super bold. I call them internet gangsters. At any rate, this chicken looks AMAZING!!! Insanely delicious!!! I think I need to be better about ignoring people :) I tend to notice negativity too much! The chicken really was delicious, the sauce was so yummy!!! Yummy. What a great way to use a treat. The recipe really was yummy and the sauce was the best part! My DIL only eats chicken or fish, so we did a couple of thigh recipes while they were here visiting. I wish I'd have come across this one, I bet she'd have loved it!! This last week has been crazy online here due to water issues, everyone is acting crazy! I'm with you on avoiding the drama! I too am weary of the drama and controversy of the social media world :) I try to just ignore as best I can, but it is everywhere these days it seems. On another note, this chicken looks delicious! I have some thighs in my freezer I may need to try this on this week. And I am so jealous of your gorgeous photos, even this one! I try to ignore it the best I can as well :) Thanks for the sweet comments about my photos, I am always my own worst critic. I never think any of them turn out well enough :) The recipe is really great, it's a nice way to use thighs (they are my favorite cut of chicken-chicken breasts are just too dry for me).